“Whereas Picasso, Matisse, even Mondrian and Kandinsky concentrated on abstracting from perceived reality, Klee began with a point, extended it into a line and famously took it for a walk wherever it wished to go.” Bridget Riley from an essay quoted here in the London Times Educational Supplement. 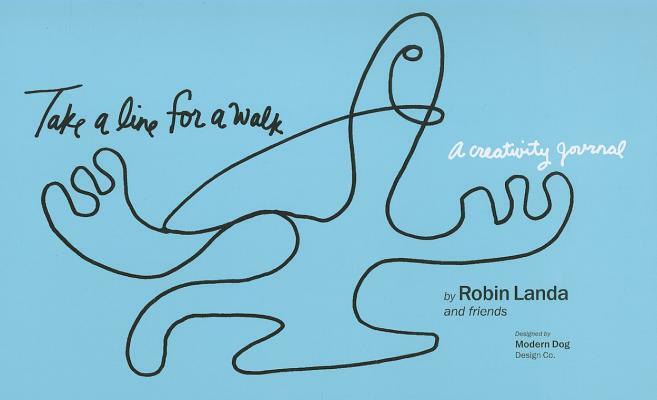 Robin Landa, a design professor at Kean College in NJ sent me a copy of Taking A Line for a Walk: A Creativity Journal. It is designed by Modern Dog. It is got me thinking about the nature of blank books. Blank books and sketchbooks like the famed Moleskine, for example, are not cheap. Walk into a Barnes and Noble and in the Remainders area you will find novels and nonfiction books for a fraction of the price of sketchbooks. These are hardcover books, tightly bound, some with high quality rag paper, – unread, unopened books. Some of these may be brilliantly written, but the publisher misjudged the market for the title, or the marketing department didn’t support the release. I’ve seen folks gesso the pages of printed books to turn them into blank books. Taking a Line for a Walk is a ‘not-quite blank’ book. It has just enough inspiration on each page that the reader, or user, in this case, is not faced with the paralysis a blank page can bring. There are prompts from great artists and designers like Stefan Sagmeister. Notebooks are very personal things, even before you make a mark in them. If you enjoy taking cues from other creative types, or if you prefer going in the total opposite direction from creative prompts, this might be the book for you. This is a great little book that should be inspiration to anyone with a creative mind. And, you don’t have to use it in any particular order. It’s sort of free flowing. Have fun!